Spoiler Warning: Make sure you’ve seen last night’s episode of The Flash before reading this post! Barry Allen and his friends finally know that Cicada is Orlin Dwyer, a dangerous man with a vendetta against metahumans. Unfortunately, there’s no way for them to directly confront Cicada without his dagger draining away their powers. However, Team Flash will come up with a plan in the penultimate installment of 2018. 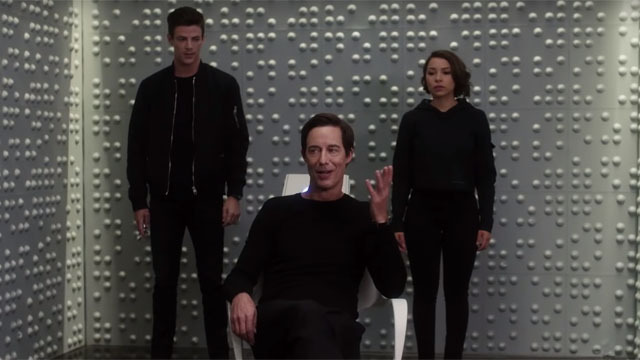 For the 100th episode, Barry and Nora are set to go back in time to get everything they need to beat Cicada. It’s too bad that Barry has a track record of screwing up his own timeline in the past. As you can see in the trailer below, several of the previous big bads are going to get in Barry’s way. Savitar, Zoom and Eobard Thawne / Reverse-Flash are all prominently featured in the footage. But there may be a few deadly surprises as well. “TOM CAVANAGH DIRECTS THE 100TH EPISODE — In the 100th episode, Barry (Grant Gustin) and Team Flash come up with a plan to stop Cicada (Chris Klein). However, the plan calls for Barry and Nora (Jessica Parker Kennedy) to travel back in time to gather some key necessities. However, Barry hesitates, concerned about his daughter seeing certain parts of his life. The Flash season 5 episode 8: “Unmasked” will air on Tuesday, December 4. You can watch the new promo below, and then let us know what you think in the comment section below!